The Government Alliance on Race and Equity announces a new tool, Racial Equity: Getting to Results, developed to assist jurisdictions use a racial equity lens to identify a set of metrics and implement a community process to have greater impact in their work. 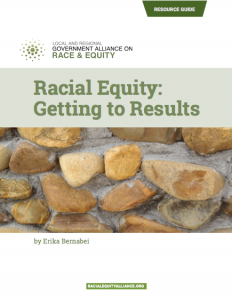 Racial Equity: Getting to Results connects a racial equity lens to the Results-Based Accountability (RBA) methodology to help empower jurisdictions to make good decisions and advance racial equity. An anti-racist, racial equity-focused RBA starts with the desired end results and works backwards towards the “how” to ensure that Racial Equity Action Plans move toward community results with stakeholder-driven implementation. The RBA framework shows a relationship between whole population level results and community indicators of those desired results to the actions that groups determine will be most effective at producing change in communities. The tool highlights root cause analysis to dig deeply into the sources of racially inequitable outcomes and walks practitioners through best practices of doing this with community stakeholder leadership and offers two short case studies. The tool also identifies critical ways that jurisdictions can disrupt historic, deficit oriented relationships to data. Tools are not the work, but they help us do work. Racial Equity: Getting to Results helps begin the process of using racial equity informed Results-Based Accountability to do more impactful work in your jurisdiction. Click the image above to download a full PDF version of Racial Equity: Getting to Results.